Posted on October 16, 2017 by Mike McKenney in Photo Gallery, USAMax Weinberg’s Jukebox concept an amazing interactive experience for the entire audience. Weinberg invites the crowd to create the performance set list by selecting songs from a menu of various artist ranging from The Beatles, Rolling Stones, AC DC, Dobie Grey, Cream, Bon Jovi, Jimi Hendricks, Credence Clearwater Revival, Steppenwolf, and the list goes on and on! 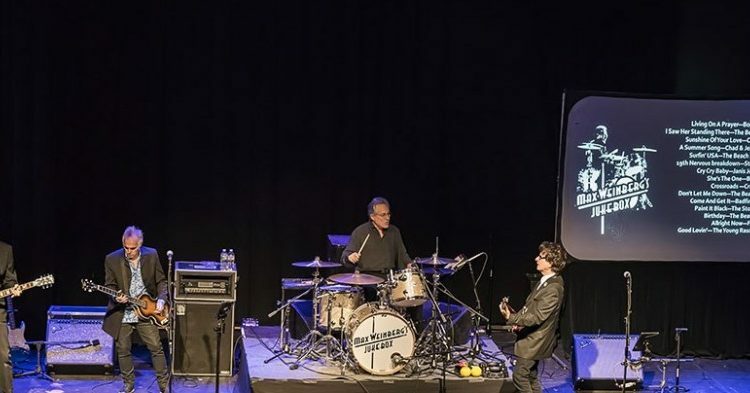 An incredible career that spans over 40 years as drummer for The E Street band, Max Weinberg is also known to millions as the bandleader on NBC’s “Late Night” and “The Tonight Show”, and comedic foil to talk show host Conan O’Brien. And if that wasn’t enough Weinberg managed to do both simultaneously from 1999–2009. 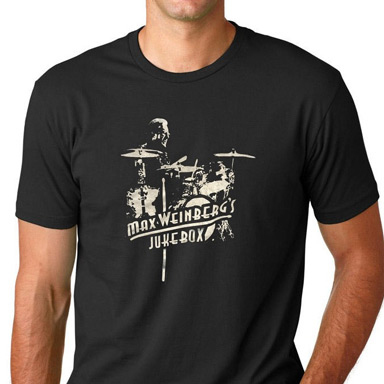 In 2014 Max along with Bruce Springsteen and the rest of the E Street Band members were inducted into the Rock and Roll Hall of Fame and Max is listed as one of Rolling Stone’s Top 100 Drummers. Throughout his 50 year professional career Weinberg has played with some of the biggest and most diverse names in music, James Brown, Paul McCartney, Bob Dylan, BB King, Tony Bennett, Ringo Starr, John Fogerty, Steve Winwood, Sheryl Crow and even Isaac Hayes performing his legendary “Shaft” with a 30 piece orchestra Max conducted on the Late Night broadcast. In 2009 he performed during the halftime show at Super Bowl 43 to the largest audience ever recorded for that event—over 100,000,000 people. He was also the drummer on the two biggest selling rock albums in history, Bruce Springsteen’s “Born In The USA” and Meatloaf’s “Bat Out Of Hell”. For the Jukebox Tour, Max Weinberg along with 3 members of The Weaklings (Glen Burtnik (Lefty Weekling), Bob Burger (Zeek Weekling), and John Merjave (Rocky Weekling) started the night off with 2 songs from the list they wanted to play and then performed hits selected from a rolling menu projected on an onstage screen. The audience yelled out what they want to hear from a menu of over 200 songs. When that started to get out of hand, Max decided to just come out into the audience and get five songs from the crowd, then ran back to the stage (he said he could only remember 5 at a time). Witnessing Mighty Max play drums is little like watching Picasso paint, the man plays to perfection on every song and never breaks a sweat. He also made an excellent choice to include these three Weaklings members. All three are first rate guitarist having played with various greats before (Styx, ELO, Billy Preston, Bruce Springsteen, and Dave Mason to name a few). Bob Burger, Glen Burtnik, and John Merjave showed their vocal versatility, deftly switching off the singing responsibilities on song requests for Beatles, Tom Petty, Bruce, Cheap Trick,The Kinks, etc..
Max is as personable as he is talented as he thrilled the crowd with stories of The Boss, telling jokes between songs, and even inviting the audience members to come up to the stage and sing the songs they choose (no one took him up on his offer this night). For the Encore of Springsteen’s “Glory Days”, Max invited the entire Odeum audience to come on to the stage and grab some maracas, tambourines, or any instrument they could find to play. The roughly 400 plus crowd (including Max’s two nieces) mobbed the stage and sang along till the final note. 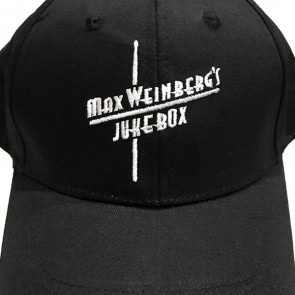 Max Weinberg’s Jukebox continues through the Fall and is a truly unique experience not to be missed. For Beatles Fans, pick up The Weeklings “Studio Two” CD/Vinyl, recorded at Abby Road Studio in the same studio the Beatles used! The Greenwich Odeum is a quaint venue, that is attracting top entertainment. With an extremely friendly staff of professionals, this recently refurbished theater is quickly becoming one of the hottest venues in New England!